Biogeography is the study of the distribution of species and ecosystems in geographic space and through geological time. Organisms and biological communities often vary in a regular fashion along geographic gradients of latitude, elevation, isolation and habitat area. Phytogeography is the branch of biogeography that studies the distribution of plants. Zoogeography is the branch that studies distribution of animals. Knowledge of spatial variation in the numbers and types of organisms is as vital to us today as it was to our early human ancestors, as we adapt to heterogeneous but geographically predictable environments. Biogeography is an integrative field of inquiry that unites concepts and information from ecology, evolutionary biology, geology, and physical geography. Modern biogeographic research combines information and ideas from many fields, from the physiological and ecological constraints on organismal dispersal to geological and climatological phenomena operating at global spatial scales and evolutionary time frames. The short-term interactions within a habitat and species of organisms describe the ecological application of biogeography. Historical biogeography describes the long-term, evolutionary periods of time for broader classifications of organisms. Early scientists, beginning with Carl Linnaeus, contributed to the development of biogeography as a science. Beginning in the mid-18th century, Europeans explored the world and discovered the biodiversity of life. The scientific theory of biogeography grows out of the work of Alexander von Humboldt (1769–1859), Hewett Cottrell Watson (1804–1881), Alphonse de Candolle (1806–1893), Alfred Russel Wallace (1823–1913), Philip Lutley Sclater (1829–1913) and other biologists and explorers. The patterns of species distribution across geographical areas can usually be explained through a combination of historical factors such as: speciation, extinction, continental drift, and glaciation. Through observing the geographic distribution of species, we can see associated variations in sea level, river routes, habitat, and river capture. Additionally, this science considers the geographic constraints of landmass areas and isolation, as well as the available ecosystem energy supplies. Over periods of ecological changes, biogeography includes the study of plant and animal species in: their past and/or present living refugium habitat; their interim living sites; and/or their survival locales. As writer David Quammen put it, "...biogeography does more than ask Which species? and Where. It also asks Why? and, what is sometimes more crucial, Why not?." Modern biogeography often employs the use of Geographic Information Systems (GIS), to understand the factors affecting organism distribution, and to predict future trends in organism distribution. Often mathematical models and GIS are employed to solve ecological problems that have a spatial aspect to them. Biogeography is most keenly observed on the world's islands. These habitats are often much more manageable areas of study because they are more condensed than larger ecosystems on the mainland. Islands are also ideal locations because they allow scientists to look at habitats that new invasive species have only recently colonized and can observe how they disperse throughout the island and change it. They can then apply their understanding to similar but more complex mainland habitats. Islands are very diverse in their biomes, ranging from the tropical to arctic climates. This diversity in habitat allows for a wide range of species study in different parts of the world. One scientist who recognized the importance of these geographic locations was Charles Darwin, who remarked in his journal "The Zoology of Archipelagoes will be well worth examination". Two chapters in On the Origin of Species were devoted to geographical distribution. The first discoveries that contributed to the development of biogeography as a science began in the mid-18th century, as Europeans explored the world and described the biodiversity of life. During the 18th century most views on the world were shaped around religion and for many natural theologists, the bible. Carl Linnaeus, in the mid-18th century, initiated the ways to classify organisms through his exploration of undiscovered territories. When he noticed that species were not as perpetual as he believed, he developed the Mountain Explanation to explain the distribution of biodiversity; when Noah's ark landed on Mount Ararat and the waters receded, the animals dispersed throughout different elevations on the mountain. This showed different species in different climates proving species were not constant. Linnaeus' findings set a basis for ecological biogeography. Through his strong beliefs in Christianity, he was inspired to classify the living world, which then gave way to additional accounts of secular views on geographical distribution. He argued that the structure of an animal was very closely related to its physical surroundings. This was important to a George Louis Buffon's rival theory of distribution. Closely after Linnaeus, Georges-Louis Leclerc, Comte de Buffon observed shifts in climate and how species spread across the globe as a result. He was the first to see different groups of organisms in different regions of the world. Buffon saw similarities between some regions which led him to believe that at one point continents were connected and then water separated them and caused differences in species. His hypotheses were described by his books, Histoire Naturelle, and Générale et Particulière, in which he argued that varying geographical regions would have different forms of life. This was inspired by his observations comparing the Old and New World, as he determined distinct variations of species from the two regions. Buffon believed there was a single species creation event, and that different regions of the world were homes for varying species, which is an alternate view than that of Linnaeus. Buffon's law eventually became a principle of biogeography by explaining how similar environments were habitats for comparable types of organisms. Buffon also studied fossils which led him to believe that the earth was over tens of thousands of years old, and that humans had not lived there long in comparison to the age of the earth. Following this period of exploration came the Age of Enlightenment in Europe, which attempted to explain the patterns of biodiversity observed by Buffon and Linnaeus. At the end of the 18th century, Alexander von Humboldt, known as the "founder of plant geography", developed the concept of physique generale to demonstrate the unity of science and how species fit together. As one of the first to contribute empirical data to the science of biogeography through his travel as an explorer, he observed differences in climate and vegetation. The earth was divided into regions which he defined as tropical, temperate, and arctic and within these regions there were similar forms of vegetation. This ultimately enabled him to create the isotherm, which allowed scientists to see patterns of life within different climates. He contributed his observations to findings of botanical geography by previous scientists, and sketched this description of both the biotic and abiotic features of the earth in his book, Cosmos. Augustin de Candolle contributed to the field of biogeography as he observed species competition and the several differences that influenced the discovery of the diversity of life. He was a Swiss botanist and created the first Laws of Botanical Nomenclature in his work, Prodromus. He discussed plant distribution and his theories eventually had a great impact on Charles Darwin, who was inspired to consider species adaptations and evolution after learning about botanical geography. De Candolle was the first to describe the differences between the small-scale and large-scale distribution patterns of organisms around the globe. In the 19th century, several additional scientists contributed new theories to further develop the concept of biogeography. Charles Lyell, being one of the first contributors in the 19th century, developed the Theory of Uniformitarianism after studying fossils. This theory explained how the world was not created by one sole catastrophic event, but instead from numerous creation events and locations. Uniformitarianism also introduced the idea that the Earth was actually significantly older than was previously accepted. Using this knowledge, Lyell concluded that it was possible for species to go extinct. Since he noted that earth's climate changes, he realized that species distribution must also change accordingly. Lyell argued that climate changes complemented vegetation changes, thus connecting the environmental surroundings to varying species. This largely influenced Charles Darwin in his development of the theory of evolution. Charles Darwin was a natural theologist who studied around the world, and most importantly in the Galapagos Islands. Darwin introduced the idea of natural selection, as he theorized against previously accepted ideas that species were static or unchanging. His contributions to biogeography and the theory of evolution were different from those of other explorers of his time, because he developed a mechanism to describe the ways that species changed. His influential ideas include the development of theories regarding the struggle for existence and natural selection. Darwin's theories started a biological segment to biogeography and empirical studies, which enabled future scientists to develop ideas about the geographical distribution of organisms around the globe. Alfred Russel Wallace studied the distribution of flora and fauna in the Amazon Basin and the Malay Archipelago in the mid-19th century. His research was essential to the further development of biogeography, and he was later nicknamed the "father of Biogeography". Wallace conducted fieldwork researching the habits, breeding and migration tendencies, and feeding behavior of thousands of species. He studied butterfly and bird distributions in comparison to the presence or absence of geographical barriers. His observations led him to conclude that the number of organisms present in a community was dependent on the amount of food resources in the particular habitat. Wallace believed species were dynamic by responding to biotic and abiotic factors. He and Philip Sclater saw biogeography as a source of support for the theory of evolution as they used Darwin's conclusion to explain how biogeography was similar to a record of species inheritance. Key findings, such as the sharp difference in fauna either side of the Wallace Line, and the sharp difference that existed between North and South America prior to their relatively recent faunal interchange, can only be understood in this light. Otherwise, the field of biogeography would be seen as a purely descriptive one. Moving on to the 20th century, Alfred Wegener introduced the Theory of Continental Drift in 1912, though it was not widely accepted until the 1960s. This theory was revolutionary because it changed the way that everyone thought about species and their distribution around the globe. The theory explained how continents were formerly joined together in one large landmass, Pangea, and slowly drifted apart due to the movement of the plates below Earth's surface. The evidence for this theory is in the geological similarities between varying locations around the globe, fossil comparisons from different continents, and the jigsaw puzzle shape of the landmasses on Earth. Though Wegener did not know the mechanism of this concept of Continental Drift, this contribution to the study of biogeography was significant in the way that it shed light on the importance of environmental and geographic similarities or differences as a result of climate and other pressures on the planet. Importantly, late in his career Wegener recognised that testing his theory required measurement of continental movement rather than inference from fossils species distributions. The publication of The Theory of Island Biogeography by Robert MacArthur and E.O. 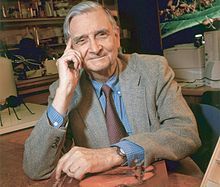 Wilson in 1967 showed that the species richness of an area could be predicted in terms of such factors as habitat area, immigration rate and extinction rate. This added to the long-standing interest in island biogeography. The application of island biogeography theory to habitat fragments spurred the development of the fields of conservation biology and landscape ecology. Biogeography continues as a point of study for many life sciences and geography students worldwide, however it may be under different broader titles within institutions such as ecology or evolutionary biology. In recent years, one of the most important and consequential developments in biogeography has been to show how multiple organisms, including mammals like monkeys and reptiles like lizards, overcame barriers such as large oceans that many biogeographers formerly believed were impossible to cross. See also Oceanic dispersal. Biogeography now incorporates many different fields including but not limited to physical geography, geology, botany and plant biology, zoology, and general biology. A biogeographer's main focus is on what environmental factors and what the influence of humans do to the distribution of the specific species of study. In terms of applications of biogeography as a science today, technological advances have allowed satellite imaging and processing of the Earth. Two main types of satellite imaging that are important within modern biogeography are Global Production Efficiency Model (GLO-PEM) and Geographic Information Systems (GIS). GLO-PEM uses satellite-imaging gives "repetitive, spatially contiguous, and time specific observations of vegetation". These observations are on a global scale. GIS can show certain processes on the earth's surface like whale locations, sea surface temperatures, and bathymetry. Current scientists also use coral reefs to delve into the history of biogeography through the fossilized reefs. Paleobiogeography goes one step further to include paleogeographic data and considerations of plate tectonics. Using molecular analyses and corroborated by fossils, it has been possible to demonstrate that perching birds evolved first in the region of Australia or the adjacent Antarctic (which at that time lay somewhat further north and had a temperate climate). From there, they spread to the other Gondwanan continents and Southeast Asia – the part of Laurasia then closest to their origin of dispersal – in the late Paleogene, before achieving a global distribution in the early Neogene. Not knowing that at the time of dispersal, the Indian Ocean was much narrower than it is today, and that South America was closer to the Antarctic, one would be hard pressed to explain the presence of many "ancient" lineages of perching birds in Africa, as well as the mainly South American distribution of the suboscines. Paleobiogeography also helps constrain hypotheses on the timing of biogeographic events such as vicariance and geodispersal, and provides unique information on the formation of regional biotas. For example, data from species-level phylogenetic and biogeographic studies tell us that the Amazonian fish fauna accumulated in increments over a period of tens of millions of years, principally by means of allopatric speciation, and in an arena extending over most of the area of tropical South America (Albert & Reis 2011). In other words, unlike some of the well-known insular faunas (Galapagos finches, Hawaiian drosophilid flies, African rift lake cichlids), the species-rich Amazonian ichthyofauna is not the result of recent adaptive radiations. For freshwater organisms, landscapes are divided naturally into discrete drainage basins by watersheds, episodically isolated and reunited by erosional processes. In regions like the Amazon Basin (or more generally Greater Amazonia, the Amazon basin, Orinoco basin, and Guianas) with an exceptionally low (flat) topographic relief, the many waterways have had a highly reticulated history over geological time. In such a context, stream capture is an important factor affecting the evolution and distribution of freshwater organisms. Stream capture occurs when an upstream portion of one river drainage is diverted to the downstream portion of an adjacent basin. This can happen as a result of tectonic uplift (or subsidence), natural damming created by a landslide, or headward or lateral erosion of the watershed between adjacent basins. Evolutionary biogeography, the proposal of evolutionary mechanisms responsible for organismal distributions. Possible mechanisms include widespread taxa disrupted by continental break-up or individual episodes of long-distance movement. There are many types of biogeographic units used in biogeographic regionalisation schemes, as there are many criteria (species composition, physiognomy, ecological aspects) and hierarchization schemes: biogeographic realms (or ecozones), bioregions (sensu stricto), ecoregions, zoogeographical regions, floristic regions, vegetation types, biomes, etc. The terms biogeographic unit, biogeographic area or bioregion sensu lato, can be used for these categories, regardless of rank. Recently, an International Code of Area Nomenclature was proposed for biogeography. ^ Brown University, "Biogeography." Accessed February 24, 2014. "Biogeography". Archived from the original on 2014-10-20. Retrieved 2014-04-08. .
^ Dansereau, Pierre. 1957. Biogeography; an ecological perspective. New York: Ronald Press Co.
^ a b c d e f g h Cox, C Barry, and Peter Moore. Biogeography : an ecological and evolutionary approach. Malden, MA: Blackwell Publications, 2005. ^ von Humboldt 1805. Essai sur la geographie des plantes; accompagne d'un tableau physique des régions equinoxiales. Levrault, Paris. ^ Watson H.C. 1847–1859. Cybele Britannica: or British plants and their geographical relations. Longman, London. ^ de Candolle, Alphonse 1855. Géographie botanique raisonnée &c. Masson, Paris. ^ Wallace A.R. 1876. . The geographical distribution of animals. Macmillan, London. ^ a b c d e f g h i j Browne, Janet (1983). The secular ark: studies in the history of biogeography. New Haven: Yale University Press. ISBN 978-0-300-02460-9. ^ Quammen, David (1996). Song of the Dodo: Island Biogeography in an Age of Extinctions. New York: Scribner. p. 17. ISBN 978-0-684-82712-4. ^ Cavalcanti, Mauro. (2009). Biogeography and GIS. "Digital Taxonomy Infobio". Archived from the original on 2006-10-15. Retrieved 2009-09-18. ^ Whittaker, R. (1998). Island Biogeography: Ecology, Evolution, and Conservation. New York: Oxford University Press. ISBN 978-0-19-850021-6. ^ Nicolson, D.H. (1991). "A History of Botanical Nomenclature". Annals of the Missouri Botanical Garden. 78 (1): 33–56. doi:10.2307/2399589. JSTOR 2399589. ^ Lyell, Charles. 1830. Principles of geology, being an attempt to explain the former changes of the Earth's surface, by reference to causes now in operation. London: John Murray. Volume 1. ^ Trewick, Steve (2016). "Plate Tectonics in Biogeography". International Encyclopedia of Geography: People, the Earth, Environment and Technology. John Wiley & Sons, Ltd. pp. 1–9. doi:10.1002/9781118786352.wbieg0638. ISBN 9781118786352. ^ Queiroz, de, Alan (2014). The Monkey's Voyage: How Improbable Journeys Shaped the History of Life. New York: Basic Books. ISBN 978-0-465-02051-5. ^ "Remote Sensing Data and Information." Remote Sensing Data and Information. "Archived copy". Archived from the original on 2014-04-27. Retrieved 2014-04-28. CS1 maint: Archived copy as title (link) (accessed April 28, 2014). ^ a b Lovejoy, N. R., S. C. Willis, & J. S. Albert (2010) Molecular signatures of Neogene biogeographic events in the Amazon fish fauna. Pp. 405–417 in Amazonia, Landscape and Species Evolution, 1st edition (Hoorn, C. M. and Wesselingh, F.P., eds.). London: Blackwell Publishing. ^ Calow, P. (1998). The Encyclopedia of Ecology and Environmental Management. Oxford: Blackwell Science, p. 82, . ^ Walter, B. M. T. (2006). "Fitofisionomias do bioma Cerrado: síntese terminológica e relações florísticas" (Doctoral dissertation) (in Portuguese). Universidade de Brasília. p. 200. ^ Vilhena, D.; Antonelli, A. (2015). "A network approach for identifying and delimiting biogeographical regions". Nature Communications. 6: 6848. arXiv:1410.2942. doi:10.1038/ncomms7848. PMID 25907961. Archived from the original on 2016-10-08. .
^ Ebach, M.C., Morrone, J.J. Parenti, L.R. & Viloria Á.L. (2008). International Code of Area Nomenclature. Journal of Biogeography 35 (7): 1153–1157,. ^ Morrone, J. J. (2015). Biogeographical regionalisation of the world: a reappraisal. Australian Systematic Botany 28: 81–90, Morrone, Juan J. (2015). "Biogeographical regionalisation of the world: A reappraisal". Australian Systematic Botany. 28 (3): 81. doi:10.1071/SB14042. .
Albert, J. S., & R. E. Reis (2011). Historical Biogeography of Neotropical Freshwater Fishes. University of California Press, Berkeley. 424 pp. Albert, J.S. ; Crampton, W.G.R. (2010). "The geography and ecology of diversification in Neotropical freshwaters". Nature Education. 1 (10): 3. Cox, C. B. (2001). The biogeographic regions reconsidered. Journal of Biogeography, 28: 511–523, . Ebach, M.C. (2015). Origins of biogeography. The role of biological classification in early plant and animal geography. Dordrecht: Springer, xiv + 173 pp., . Lieberman, B. S. (2001). "Paleobiogeography: using fossils to study global change, plate tectonics, and evolution". Kluwer Academic, Plenum Publishing, . Lomolino, M. V., & Brown, J. H. (2004). Foundations of biogeography: classic papers with commentaries. University of Chicago Press, . MacArthur, Robert H. (1972). Geographic Ecology. New York: Harper & Row. McCarthy, Dennis (2009). Here be dragons : how the study of animal and plant distributions revolutionized our views of life and Earth. Oxford & New York: Oxford University Press. ISBN 978-0-19-954246-8. Millington, A., Blumler, M., & Schickhoff, U. (Eds.). (2011). The SAGE handbook of biogeography. Sage, London, . Nelson, G.J. (1978). From Candolle to Croizat: Comments on the history of biogeography. Journal of the History of Biology, 11: 269–305. Wikimedia Commons has media related to Biogeography.